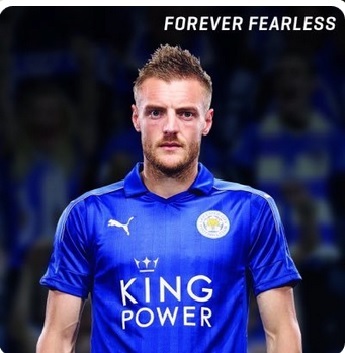 Jamie Vardy has made his intentions clear that he is set to stay with Leicester City despite Arsenal’s offer, by changing his Twitter profile picture to him in the new Foxes home strip with the byline “Forever Fearless”. The England international has been strongly linked with a switch to the Emirates Stadium this week, with reports claiming the Gunners had triggered his £22 Million release clause. Leicester were claimed to have tried to counter that with a contract offer of their own, and he has today changed his profile picture to one of him in the home strip of his current club, which will be worn next season. Monday was the deadline given for an answer on whether he would be making the switch, and he appears to have given us a resounding no. There could be hope that this is a negotiating tactic in an attempt to maximise his profit from the saga, be it with a bigger contract with the PL champions or with Arsenal, but either way, it is a huge response to the current speculation. The striker jetted off to France today to play his part in England’s European Championship’s campaign, and looks likely to play off of main striker Harry Kane in either a 4-4-2 or 4-3-3 formation. This will be his first international tournament, and next season will be his first season in the Champions League, whether with Arsenal or Leicester. We are also linked with a move to sign Alvaro Morata this summer, and the other hope is that proceedings for his signature have advanced, making the bid to sign Vardy null-and-void. Would you prefer Morata to Vardy? Could the England star be trying to bargain with the frugal Arsene Wenger? Or has he simply closed the door on the idea of switching clubs? Who would you want at Arsenal? This entry was posted in Arsenal News, Arsenal NewsNow, Arsenal Transfer News and tagged Arsenal, Leicester City, Morata, vardy on June 6, 2016 by GoonerP. We’re complaining about the age because in 2 years time we will find ourselves in the same position. We need a striker who will have a solid 5-6 years of consistency hence why a younger option would be preferred. United have Martial and Rashford already performing and Zlatan to guide them, we will have Vardy and no one else, Sanogo isn’t showing signs of improvement and neither is Apkom. Vardy is a good buy for the short term but we also have to be thinking about the long term. We don’t want a Sanogo or an Apkom, we want a forward that’s entering their prime or a young one that has already proven to have top class talent. There is going to be a ton of Arsenal fans (including those who already praised his “signing” and welcomed him to Arsenal) coming out to diss him now. I can’t wait to read plenty of “wtf does he think he is anyway, he is just a one-season wonder”.. “I never really wanted him at Arsenal cos he isn’t classy and he’s a cheat and a diver”.. I mean y’all get the drift. Arsenal fans for you. Hahaha ? well said mate! I hope that they fall whilst jumping from one bandwagon to the other! ?? Apparently, Vardy’s tweeter header was changed to a team photo of them lifting the premier league trophy. The owners gift of a solid gold crackpipe with diamonds, must have done the trick! ??.. thank God for that! In other news, Walcott is staying and has accepted the wide role. As for Morata, he has injured his dodgy hamstring! … Next! Jansenn or Milik? … ? Synthiago, yeah, you will get some tools like that. But they’d usually be the tools that raved about Vardy all last season, looking on enviously, but went back on it to instead scoff at his signing for Arsenal. So the tools who usually jump ship like you mention, already jumped ship in the first place. As I can’t stand either of them, let alone rate them!! Unless you have proof, stop talking ? with your delusional accusations… ffs! ? I don’t think it’s just Arsenal fans that do that? It’s human nature, not just fans from one specific club. Apparently Arsenal fans got blamed for starting WW2 and the sinking of the Titanic too. I actually respect him for staying. And Arsenal have other targets. Slightly gutted but wasn’t completely sure where Wenger was going with this. Naive to think he’d leave and come to us really. Now all other epl fans will again be laughing at poor old arsenal turned down but the likes of vardy, I can hear it now! Let’s hope we now get a striker sorted that’s maybe more suited to us. Dig deep arsene! I reckon he got hacked, I don’t think he would answer this way. This is how a dumb fan would think is a good way to answer. He wouldn’t agree to terms, clubs agree to buy out terms, and then answer vaguely through a twitter heading. I think he’s coming. I think Giroud is a plonker for trying to put the mockers on it. Though I am not sold on Vardy. I am pretty certain that he is an Arsenal player already.. too many indications (and direct quotations) to prove that Arsene has gotten his man. That picture up there is a poor attempt at photoshopping him (look closely at his right hand, and you’ll notice what I noticed). Sportsmail did something similar on their website with him (Vardy) in an Arsenal jersey while in action. I also think Vardy will be a good example to some of our younger players, at least in the work hard and perform and you get your reward. Unbelievable, you took contradiction, to the extreme!!!! ?? We are just bombing comment upon comment without asking question, whether you like Vardy or you don’t you can’t change the player he his. between the foxes, Vardy and the Gunners, they know what they want from themselves. I have check all the sport site (news) I know and nothing of such to what you wrote. How true is that news??? because he change his profile twitter profile picture doesn’t mean you have to jump into conclusion, or Wenger told you by himself??? its a big shamw if we miss out on Vardy, but it open doors for new targets. it made me wonder why Arsenal are the only player after him? all that twitter whatever is bs…I’m pretty sure, we wld have been on his case for a long tym b4 any silly newspaper/reliable source wld know…Wenger likes his business done privately and will only give out wat he wants out…remember Sanchez, elneny, even xhaka…their photo-ops were done in London but no 1 will knw they r in london…it would have been a surprise when we announced xhaka if not for his wife and I’m pretty sure Wenger was pissed…even xhaka said he had to keep it quiet…Im still waiting for d supposed ‘oracle’ in bbc…he’s been unreliable this past few days…that tells u how secretive arsenal is…y have Leicester not said anything???? He did bought Xhaka and thrown 30M pounds in a flash. He did triggered Vardy’s 22 M buy out clause didn’t he? The negotiation is still in the process. So, you might be having some kind of illusion yourself. I have looked up the 2016/17 home kit. It has gold piping on the shoulders to denote the champions. I see no piping on this photo. Crown is also gold as season just gone, this picture crown is white. I have no idea which kit the shirt vardy is wearing comes from. I have looked again and shirt has a collar so I think it could be the new kit, perhaps just a bad photo. Have to admit not getting Vardy is the last of my worries, for some reason I just didn`t take to him, maybe it was his attitude towards the referee when he got sent off and suspended, it wasn`t very professional. Looks like my above comment could have hit the mark because that appears to be what has happened, vardy seems to be staying at leicester and on an improved contract. Everyone is a winner, except us fans who want to win the PL.